La historiadora Claudia Bodinek acaba de publicar un libro titulado Raffinesse im Akkord - Meissener Porzellanmalerei und ihre grafischen Vorlagen (Dresde, Staatliche Kunstsammlungen Dresden, 2018) que reúne las fuentes iconográficas de la porcelana de Meissen. Entre estas fuentes se encuentra la obra de Daniello Bartolli Dell'historia della Compagnia de Giesu, publicada en 1653. El ejemplar que ha utilizado la autora se encuentra en la Biblioteca Histórica de la Universidad Complutense, identificado con la signatura BH FG 2962. The Flemish painter and engraver Jan Miel (1599-1663) sketched the frontispiece of the description of Asia Dell'historia della Compagnia de Giesu by Daniello Bartolli published in 1653. 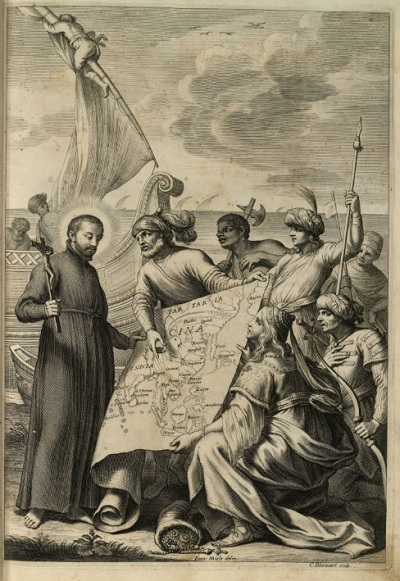 The book deals with the missionary journeys of the Jesuit priest Francis Xavier to East India. His destination was China, but the local authorities refused him entry throughout his life. The scene on the frontispiece was picked up about 75 years later by painters of the Meissen porcelain Manufactory. Possibly no less than Johann Gregorius Höroldt, who developed a specific type of Chinoiserie painting at Meissen, recognized the decorative potential of the pictorial motif and transformed it into a new pattern in the spirit of the prevailing Chinese fashion. By doing so the slim Jesuit priest became a corpulent oriental potentate who approvingly looks at a map, while the Orientals in the group of figures on the right where now changed into Chinese by getting suitable dresses. In this form the pattern is known from two shell-shaped basins, two stands for tureens and a large box. All the five pieces are recently published with a short comment in: "Raffinesse im Akkord. Meissener Porzellanmalerei und ihre grafischen Vorlagen", edited by Staatliche Kunstsammlungen Dresden and Claudia Bodinek, Petersberg 2018.